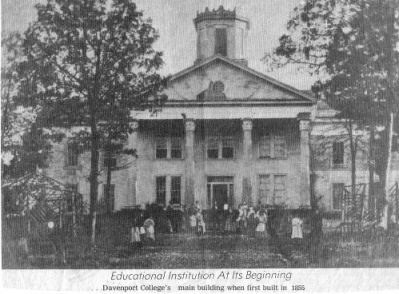 Davenport College was established in Lenoir in 1855 by the Methodist Episcopal Church, South, as an institution of higher learning for women. It was named for William Davenport, the largest contributor to the enterprise. William A. Lenoir offered land overlooking the town for the campus, on which a classroom building, a chapel, and a dormitory were erected. The school held its first classes in 1857 and was incorporated as Davenport Female College in 1859, when enrollment stood at 56 students, all from North Carolina and South Carolina. Despite hardships, the college stayed open during the Civil War only to burn to the ground in 1877, without insurance to cover the $25,000 loss. Davenport reopened in 1884, serving primarily as a local high school. By the early twentieth century, Davenport had elevated its academic standing and met the qualifications for accreditation as a two-year college, admitting both women and men. It held this status until 1933, when it succumbed to the economic chaos created by the Great Depression. Five years later, all remaining assets and personal properties belonging to the school were merged with Greensboro College. The buildings were transferred to the town of Lenoir for use as an elementary school. According to the North Carolina Booklet (Volume 16, 1916), William Davenport, also known as Colonel William Davenport, fought in the American Revolution and was elected to the General Assembly from Wilkes County in 1813. He was one of the founders of Davenport College. Nancy Alexander, Here Will I Dwell: The Story of Caldwell County (1956). E. Carl Anderson, ed., Heritage of Caldwell County, North Carolina (ca. 1983). "Davenport College's first building was built in 1855." Photo courtesy of Caldwell Heritage Museum. The William 'Henry' Davenport, 8 May 1868–20 May 1936, that is linked from this article is not the philanthropist associated with the inception it. I think you want to reference Colonel William Davenport Jr, 12 Oct 1770-19 Aug 1859, or perhaps a son named William, for which I have no record. This William Davenport was the son-in-law of Major General William Lenoir, whose grandson William Avery Lenoir may be the one contributing the land. Thank you for visiting NCpedia and alerting us to this linking error!